Nice combo of colours. Could you please let me know what your benchtop and splashback colours are please. Hi Tracey, we are still waiting to have the final product installed. Because we wanted to match the colours in the splashback with the cabinetry there has been a fair bit of background work involved to calibrate the printer etc. I will post a photo once it's done. Oh excellent, thank you, it looks lovely! I have been to many of the suppliers but QQ is too far away for me with a screaming baby in the car and they won't mail me samples! Once I choose a stone mason I will view them in person because I hear even with Quartz each slab can be a little different. I was thinking maybe Lexicon quarter...warmed up a bit...but I'm not sure. Thanks for the warning, I do have time on my side so I might go get some sample pots and see what actually looks ok with our lighting. Perhaps you could follow MB's advice and match the sofa colour for the splashback, then introduce the teal blue with accessories. I like the following images showing those tones together. 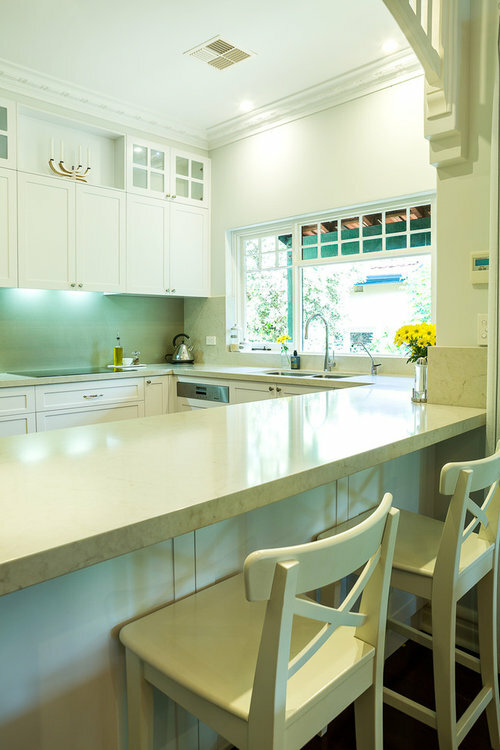 You would need some more wood items to add warmth to the glossy white kitchen though. Do you have a picture of your sofa handy? I would go for high gloss black tiles. I know you said natural light is low but you can get black tiles with such a high gloss they reflect a lot of light. The black would look dramatic.